Taking out income protection, or any other insurance for that matter, can often start off with good intentions, possibly spurred on by a job change, new mortgage or birth of a child and maybe we have an initial look but get don’t quite get over the finish line, leaving it on the ‘to do list’ for another day. We cover each of these points in little more detail below but feel free to contact us on 02084327333 to discuss your specific situation further. For all but the most manual of occupations it is usually possible to take out a policy with premiums that are fixed over the life of the policy. This is often the most cost effective way of setting up cover for the long term as the insurer cannot increase your premiums as a result of their claims experience. As the risk of needing to claim increases with age so does the entry premium the insurer charges (which is then fixed over the policy term with ‘guaranteed premiums’). Here is an example of a non-smoker looking to cover £1,500 per month with the policy paying out after 13 weeks of incapacity. The plan runs to age 65 and could payout until that age if the client couldn’t return to work. 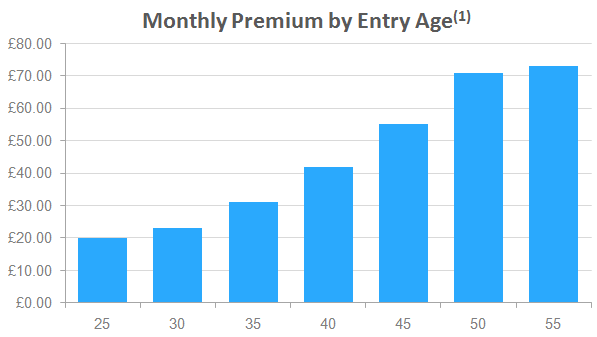 As the chart shows, premiums rise significantly with the entry age to the policy. 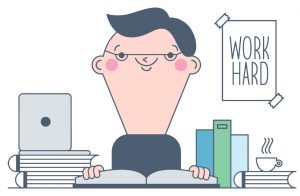 It therefore makes sense not to leave taking out cover on the ‘to do list’ for too long as your policy could end up costing a lot more. In other words, it often makes sense to lock-in your premiums at as young an age as possible. The section above showed how much the premiums can go up with entry age, indicating that it can pay to take out cover earlier rather than later. Naturally you would be paying the (lower) premiums for longer and be covered for longer, but one surprising outcome of some research we undertook in 2013 was that it can often work out cheaper in total by taking out cover earlier (you can see the research here). In a large number of cases the total premiums you pay (i.e. monthly premiums multiplied by the total number of months your policy lasts) can actually be lower the younger you take out cover. Potentially being covered for longer for less is another reason why it could pay not to delay. When taking out income protection you will disclose medical information to the insurer (we complete applications for our clients over the telephone) and based on that information the insurer will decide if they need to place an exclusion on the policy or increase the premiums charged to reflect a higher level of risk. A big part of our job as independent advisers is speaking with the underwriters at all leading insurers in order to try and obtain the best terms for our clients. The simple reality is that every day there is a chance something could happen to our health, whether that is due to an accident or illness, and therefore it makes sense to take out cover before something does happen and you potentially end up with an exclusion or increased premium, or even worse the insurers decline offering you cover at all. We simply want to ensure you have all the available information when making a decision as to which income protection product best fits your needs. From simply finding out whether an insurers premiums are guaranteed or wanting to know the claims statistics for a particular insurer, please do not hesitate to pop us a call on 0208 432 7333.